This morning, even though the farmer usually starts harvesting for tomorrow’s CSA and market first thing, we lingered over our cups of coffee talking greenhouses. This is a topic that often comes up, but it is at this time of year that we think about it most. 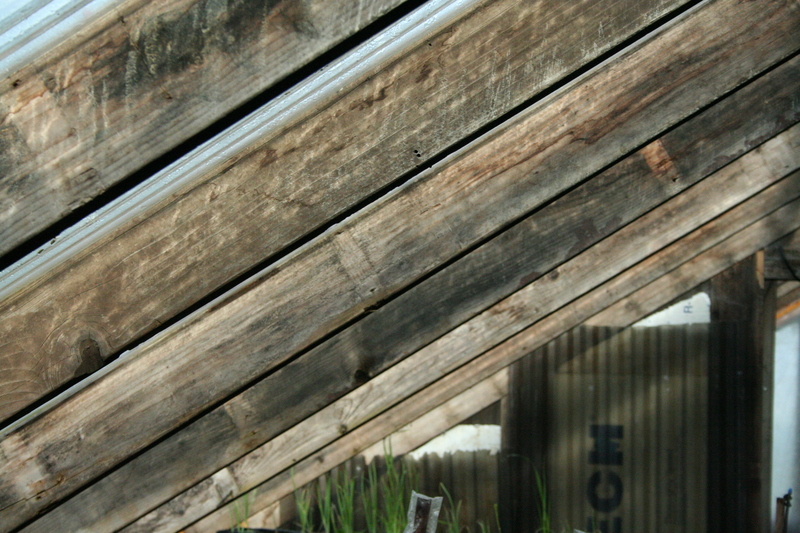 When we started farming, we used a small little house constructed of pvc-pipe given to us by a friend. We covered it it in recycled plastic sheets removed from another friend’s large hoophouse when he was replacing it with new plastic. It was a fine size for using as a place to start our seeds in late winter/early spring, and that was what our immediate need for a greenhouse was. 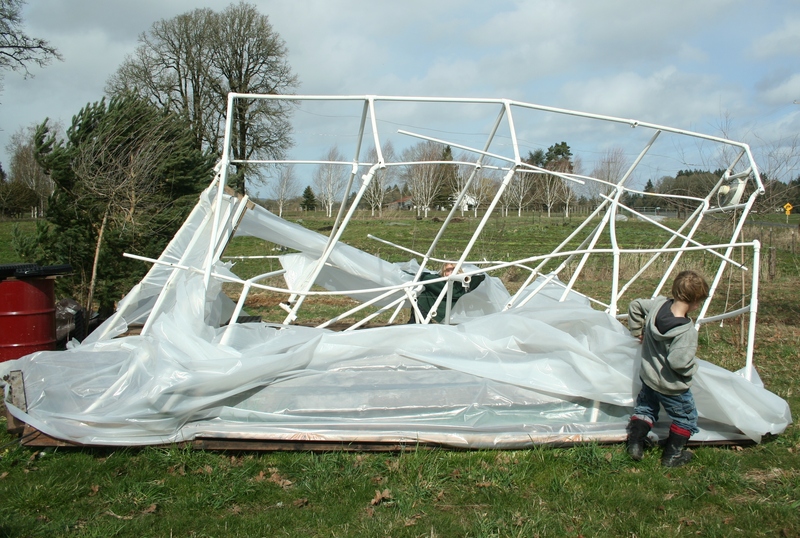 Every spring, though, when the winds would rise, and usually before our starts were all planted out, this flimsy little greenhouse would get ripped apart. The last time this happened, the plastic we were using was finally too shredded to reuse. And so we had to take all that plastic to the dump: we could hardly stand it! Since that time, and always really, we haven’t been able to decide how to fit the use of plastic into our vision of sustainable agriculture, or our original driving principles of permaculture, which aims to create a permanent agricultural system. There has also, however, always been reality to deal with too, and the truth of the matter is that season extension is pretty important in many ways, the most significant being, we want to provide as much food as we can year-round for our community. Just as strongly as we believe in sustainability and permanence, we believe in eating locally. For all of you to be able to continue eating delicious and fresh, locally grown food in the winter months is just as important as is is during the abundance of summer. And we really, really appreciate farms like our fellow farmer’s Denison Farms at the Saturday market, who with the use of lots of hoophouses are able to bring a wonderful variety of foods year round. We also, quite honestly, need to be competitive, and every other farm in our area uses some hoophouses or grows partially on black plastic. Our crops grown out of doors and in the soil will always be behind those grown in these conditions. We have a small amount of crops covered in mini hoophouses in the field, using more recycled plastic from old greenhouses, but we could easily see the benefit of having so much more covered. 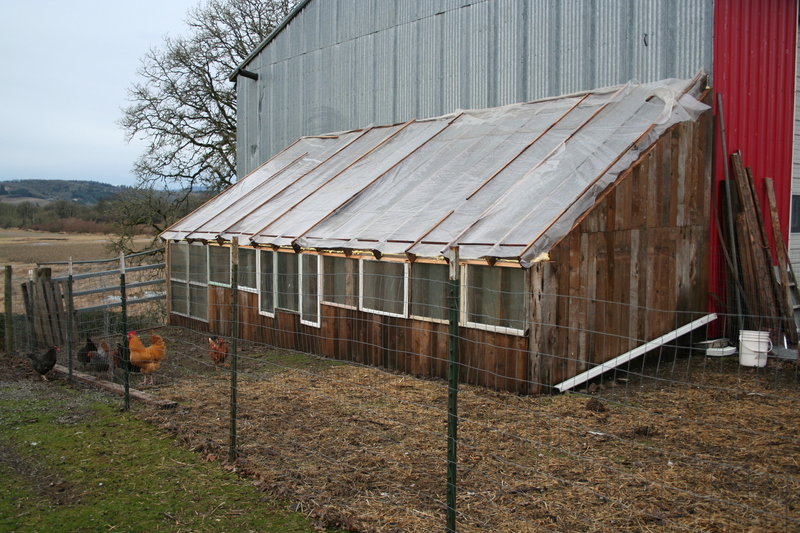 Two winters ago, we built this wood framed passive solar greenhouse off the south side of our machine shed. We didn’t want to hassle with that flimsy pvc framed house blowing around in the spring anymore, and we had reached a time when we needed more space anyways. The intention with this greenhouse is to ultimately cover it with glass. For the first year, we again used the plastic we had around. This year we replaced that with corrugated fiberglass that came from a small greenhouse we helped remove from someones property. This will be somewhat more permanent until we get all the glass together and installed. This is the kind of greenhouse we always envisioned. Inside, we have been able to play around with a layered system, providing multiple uses beneficially. Underneath the tables we use for starts, we scattered straw innoculated with elm mushrooms. Last year we used the space to brood our baby chickens at the same time we were germinating most seeds and this added warmth to the greenhouse at a cold time of the year. This year we switched to water barrels to collect the sun’s warmth and bring up the temperature inside. We added a wall to the west end and created a mini space inside of the larger space to keep extra warm in order to start our warm weather crops like tomatoes and peppers. The farmer is experimenting with growing carrots in large pots, has peas growing up the unused wall, already harvested a small crop of bok choy with no flea beetle damage, and has the basil that will stay in the house all summer potted up. It has been fun and useful and we only which it were bigger. 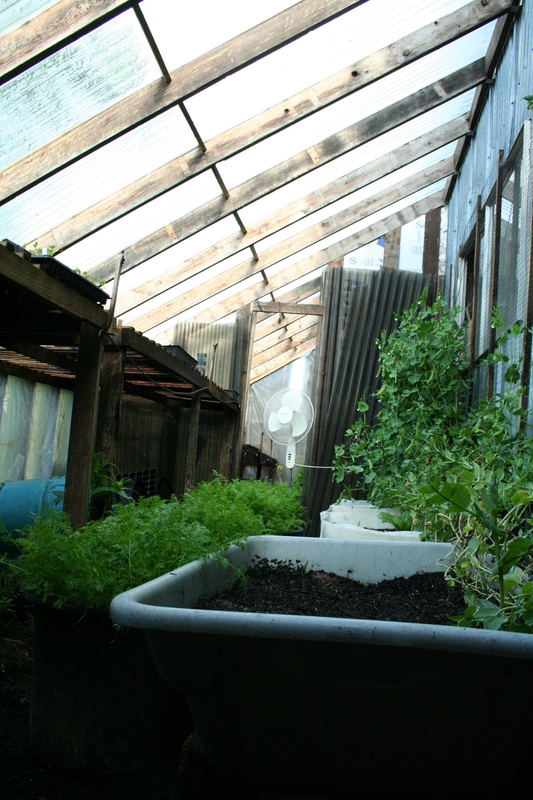 This morning we started talking in earnest about doing just that, making larger versions of such a greenhouse. The farmer is tired of me pushing him to consider moving towards getting some hoophouses, but I have always felt pretty stongly that we needed more space in season extension. So, we are going to draw up some plans and figures and just go with our guts on this one. To actually build these, we will have to get some funding, something we have yet to do formally in our business venture. But we feel that it will be worth the extra cost to keep both our idealism and practical business needs happy. If it seems doable in the end, and the finances are there, we will hopefully be building these this winter! Then next spring, no matter how long the cool and wet weather seems to last (we ended up starting a fire last night! 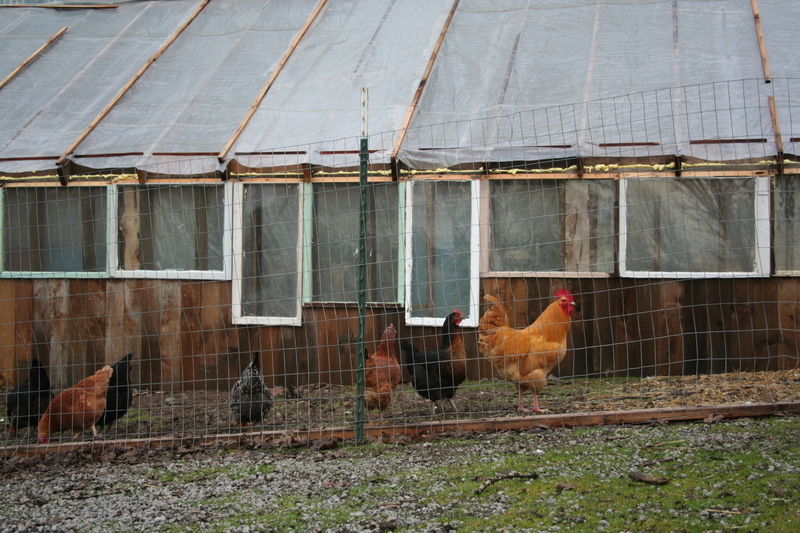 ), we will have a warm and dry–and even spring pest free–place to grow more food. That is a happy thought!